How to make elderberry syrup, plus 3 tips for making the best batch! 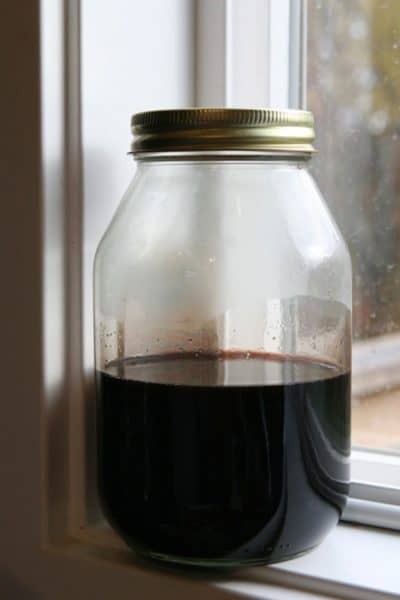 Last year I posted how I made elderberry syrup and over the winter I was able to test and try out a few new ways of making elderberry syrup that make it more palatable and medicinally potent. Now I have a list of tricks and tips I’m going to share with you for how to make elderberry syrup based on preferences and needs. 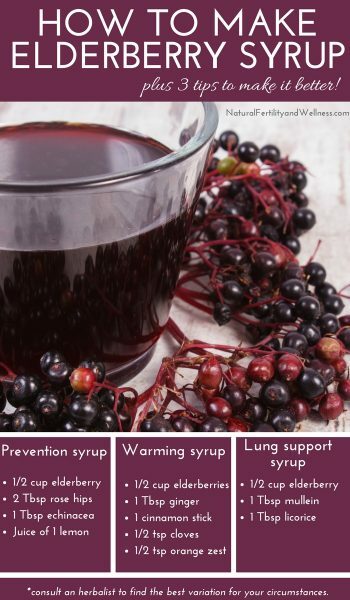 Elderberry (sambucus nigra) has many benefits, but what most people use it for is to help prevent and reduce the severity of the flu. It’s been used by herbalists for many, many years and studies are now finding that this is the case in many strains of the flu virus. I’ve used it on a preventative basis as well as when I begin getting sick and I definitely like to have this herb in my natural medicine cabinet at all times. Everyone knows the flu is miserable and we often take multiple types of medication to help relieve some of the symptoms, many times using over the counter pain relievers like ibuprofen, naproxen, and aspirin (NSAIDS). 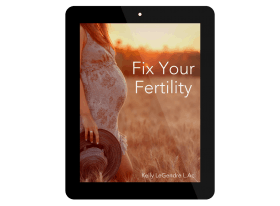 While I know there are times when medicine has its place (I usually have a couple of OTC pain relievers on hand just in case) you should also know that more recent studies are finding that the use of NSAIDS can dramatically reduce ovulation with consistent use. One way for me to reduce the amount of this specific type of pain relievers I use on a regular basis is by taking steps to keep my body running well and take precautions during cold and flu season. Elderberry syrup (or tincture) is one natural remedy I always have on hand to do just that! Making elderberry syrup is easy and there are a lot of different recipes out there, but I want to hep you make the best batch possible! One – Don’t boil the elderberries. This tends to change not only the flavor, but vitamin C does not hold up well to heat and will be reduced in the final product. Even at a steaming temperature you may lose some of the vitamin C, but boiling increases that loss. Fresh rose hips are a great source of vitamin C and contain about 200% of the recommended daily value (dried hips may still contain about 60% of the RDA). They are also known to be a cooling herb as well as a relaxant. Mullein is an expectorant and useful for those that tend to get lung congestion with respiratory illnesses. Licorice may help relieve painful unproductive coughing, act as a soothing expectorant, and reduce inflammation in the mucous membranes throughout the body. Echinacea is an immune stimulant and good to add in when you take it at the first sign of illness. Ginger has anti-viral actions, helps to stimulate the immune system and is a warming herb. *Herbal information taken from multiple sources, including The Herbarium, and is meant for educational purposes. Please speak with a qualified herbalist to figure out which herbs are best for your situation. Three – In order to keep your syrup making, and the dosage, consistent make sure to steam the liquid to the same measurement each time. And keep track of what works best for you and your family! 1. 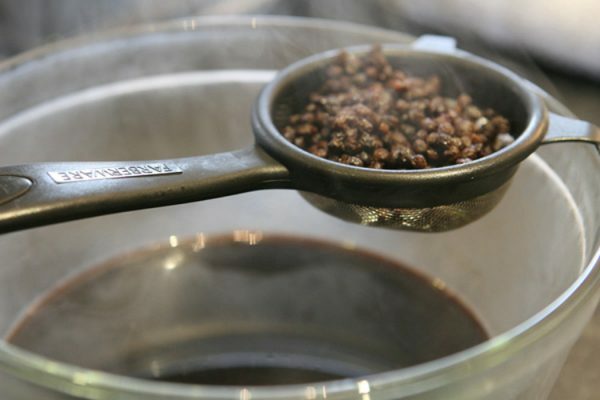 Place 1/2 cup of dried elderberries and two cups of water in a small saucepan over medium heat. 2. 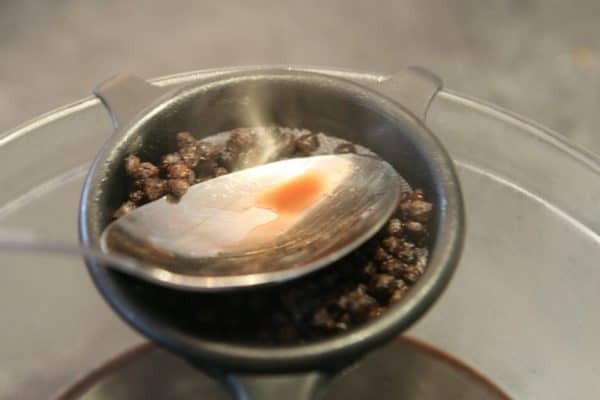 Once it begins to steam, keep at this temperature for approximately 30 minutes. Do not let it boil! I find that boiling will cause the taste to be…..off, and a bit bitter. 3. Strain out the berries and herbs. 4. and then just use the back of a spoon to squeeze out any juice left in the berries. Just don’t press too hard or you’ll get a bit of the solids. Measure the liquid remaining. If you have more than one cup, place it back into the pan and steam until reduce to one cup. The reason we reduce the liquid is to make this into what is called a decoction and it reduces the amount we need to take. This also makes sure that we have consistency in dosing! If you have 1 cup of liquid one batch and 1 and a half cups left the next time, the dosing won’t be the same. 6. Once cooled to warm room temp, add in the honey and stir until combined. Honey has it’s own antiviral properties and is also used to make it taste great and acts as a natural preservative. Raw honey is the best option to use, which is why you’ll want to wait until the liquid cools before adding. This way you’ll protect the properties of the honey. For preservation purposes, you need to use a 1:1 ratio of liquid to sugar. If you plan on consuming it within the week, just sweeten to taste. (I find that 1/2 cup is sweet enough!) 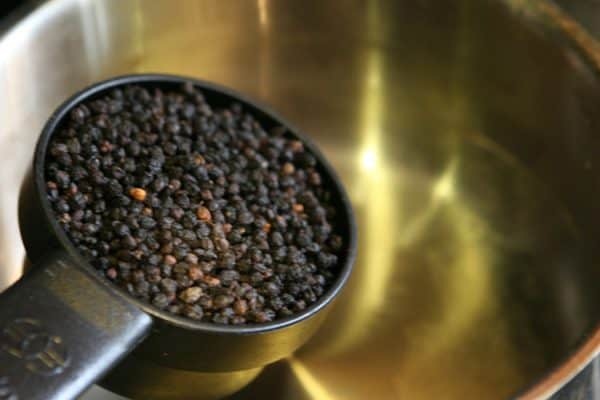 You may also add a few tablespoons of vodka or brandy to enhance flavor and preservation. Many times I’ll add one tablespoon of my elderberry tincture. Fresh lemon juice is a great addition to elderberry syrup! It adds about 30-40mgs of vitamin C if you use the juice of one whole lemon and it balances out the flavor profile perfectly. 7. Once thoroughly combined, just place into a storage jar and keep in the fridge! 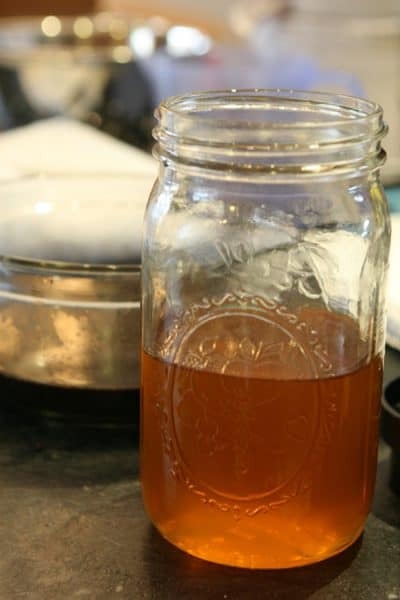 I find that the syrup lasts for a few weeks in my fridge when I use a full cup of honey and add in a tablespoon or two of vodka or brandy, though usually, we go through it more quickly than that. 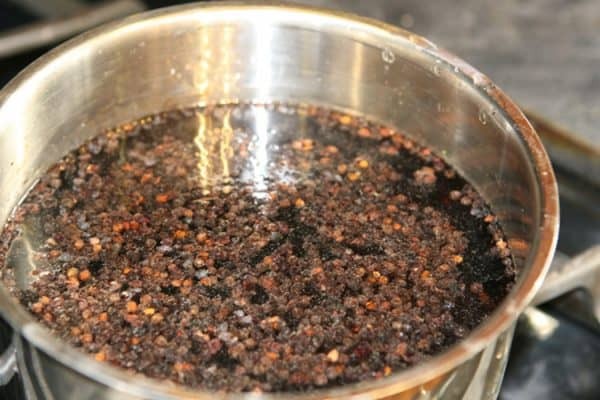 If you’d rather have elderberry on hand for the adults in the family, you can also make an elderberry tincture which will keep for many, many months and does not need to contain any sugar. I also recommend getting dried elderberries from Mountain Rose Herbs! While my preference is to use fresh berries, those are only available for a couple of weeks each year (and you have to go pick them yourself!) so I’ve purchased dried berries from the above stores many times myself. Pour boiling water over dried berries (and rose hips if using). Strain out the berries, use the back of a spoon to squeeze out any juice left in the berries, being careful not to press the berries through. Place the liquid back into the pan and heat only until it begins to steam, do not let it boil. Once liquid has been reduced by half, let cool. Add in honey (and lemon juice if using) and stir until combined. For preservation purposes, use a ratio of 1:1 liquid to sugar. Add a few tablespoons of vodka or brandy to enhance flavor and preservation if desired. Place into storage jar and keep in the fridge. Oh, I beg to differ on the “preventative” part. 🙂 My kids and I were all taking elderberry syrup daily. My husband wasn’t. We got sick. The kids were over it fully in a week, maybe less. I’m still coughing a little but was mostly better in a week. My husband’s been sick for THREE weeks now…coughing constantly. We suspect whooping cough, as it’s going around here. Although he’s the only one who’s had “real” full symptoms — I had many symptoms (the cough, headache), the kids? Nearly nothing. Minor coughing. Elderberry was the major difference between my husband and the rest of us, because we were all eating well. So it definitely had some effect! Kate, thank you for sharing your story. I am new to this wonderful herb. Usually when I’m sick I take tons of garlic oil, but I wasn’t sure how safe it is to take when pregnant. So when I got sick my friend told me to try elderberry. I feel much better and my little 19 month old thick boogers are gone after just one dose! I’ve yet to try this recipe but from what I know of sugar, it lowers the immune system. The addition of honey isn’t necessary for the elderberries to do their work, it just makes it more palatable. So you can easily leave it out. And when you take a tablespoon or less of the syrup each day, the amount of honey you’re consuming is actually quite small. Question: following this recipe, what is the suggested daily dosage? And, is it okay to take it all at once, or more effective if taken in smaller doses morning and evening? @Dani, Most people take a Tbsp or so per day, split into 2 doses. half of that for kids. I’m just making this and I didn’t really follow your directions on sugar? Can you clarify please? Thanks!! @shelley, I normally add the honey in after the elderberry liquid is cooled in order to retain the beneficial RAW part of the honey. if you use a different sugar you can add it at any time. I just made this recipe and used 1/2 c honey and its super sweet. I think I would like to use less next time, but am curious if that would make it less beneficial. Can you freeze this and still retain all the benefits? @Sofia, I don’t see why not, though I think I’d freeze it without the honey and add that in later. Though with the honey, this should last for quite some time. Many keep it for a month or more, and I’ve never had it go bad. I have seen it mentioned on other websites to let the berries soak in the water (in the fridge) for 24-48 hours. Do you see any benefit to the longer soak time vs. the 30min simmer? @Thea, The hot water pulls out the medicinal parts of the herb – and you keep it just hot enough to steam – not quite a simmer. If you just let them steep in room temp water, it will take longer. I have no idea why you’d steep them in the fridge, it won’t go bad in just a day or two. 🙂 Plus, with cold water it would take forever, if at all. The hot water helps to break down the cellular walls. hello there and thank you for your info – I’ve certainly picked up something new from right here. 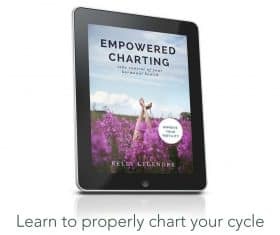 I did however expertise several technical points using this site, since I experienced to reload the web site a lot of times previous to I could get it to load properly. I had been wondering if your web hosting is OK? Not that I am complaining, but sluggish loading instances times will very frequently affect your placement in google and can damage your high-quality score if ads and marketing with Adwords. Well I’m adding this RSS to my e-mail and could look out for much more of your respective intriguing content. Is there any reason that you reduce the liquid after steeping instead of just using half as much water for steeping in the first place? It’s just the traditional way to make an herbal decoction. 🙂 Plus the dried elderberries will swell up, so if you don’t use more water in the beginning they may not be fully covered. Thanks for the recipe. Its good to DIY as its so expensive to buy out there. From your knowledge, is this suitable for pregnant mummies? I just recently became interested in a more natural way of healing (getting tired of pills). I’ve read articles concerning elderberries and medicinal values of this fruit, so of course, I wanted to give syrup making a try. I noticed in the picture above there are light colored (tan-ish) looking berries. What are those? Are they unripened elderberries and should they be removed before processing? Those were probably berries that weren’t quite as ripe as most of them, though not green. I do try to take out all of the green ones, but if they are almost ripe I don’t worry about it. In my experience, I’ve never had an issue with it! Would you say cooking takes away any of the toxicity of the unripe berries? I honestly don’t know, but I’ve always been told not to use unripe berries. I pick out all the green ones before I make syrup, the only ones that get through are the ones that are a lighter red color and those are the ones that are a bit brown in my photo.